The Marine Resources Council's Right Whale Monitoring Program was established in 1995 to reduce human impacts to the endangered North Atlantic right whale. Citizens on the east coast of Florida report land‑based sightings of right whales to our hotline (1‑888‑97‑WHALE). This information is passed on to local ship traffic to avoid ship strikes, which account for over one‑third of documented right whale deaths in the North Atlantic Ocean. First Mom/Calf of 2017 Season Visits Brevard Co.! 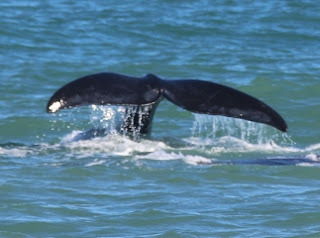 Brevard County enjoyed its first North Atlantic right whale sightings of the season this past weekend. Tentatively ID'd as Catalog #1711, this 30-year-old mom cruised southward through Satellite Beach Saturday, Jan. 14, 2017 with her 3rd calf. She was spotted moving through Melbourne Beach waters on Sunday, Jan. 15th and at 6:00 pm was about a mile north of Sebastian Inlet. FWC officers at the inlet say the pair spent a few hours west of the bridge during the night, but made it safely out around 12:25am Monday morning. #1711 gave birth to the first of 3 calves this season so far. She last calved in 2009. #1711 is one of only 4 adult North Atlantic right whales known to be in the southeast U.S. right now (3 of which have given birth, making a total of 7). It's been a very slow season with few whales, few calves, and with sightings happening later than usual. So, for those of you who have seen her so far, count your lucky stars! For those of you who haven't, she was headed south when she left Sebastian Inlet, so she's got to turn around and head north at some point! Enjoy any chance you get to see them, but remember to keep your distance. The legal approach limit is 500 yards. We'd like to thank Space Coast River Tours (SCRT) and Port Canaveral for helping to organize our boat trip on January 17th around Canaveral harbor. Twenty-seven people were aboard with Julie Albert to learn about right whales in Florida waters. For the last three years or so, we've done one or two boat trips per season and they're received quite well. This year, the weather was beautiful, SCRT found several dolphins for us, and a turtle greeted us before we even left. If you missed that boat trip, you can catch them again to see our local wildlife! 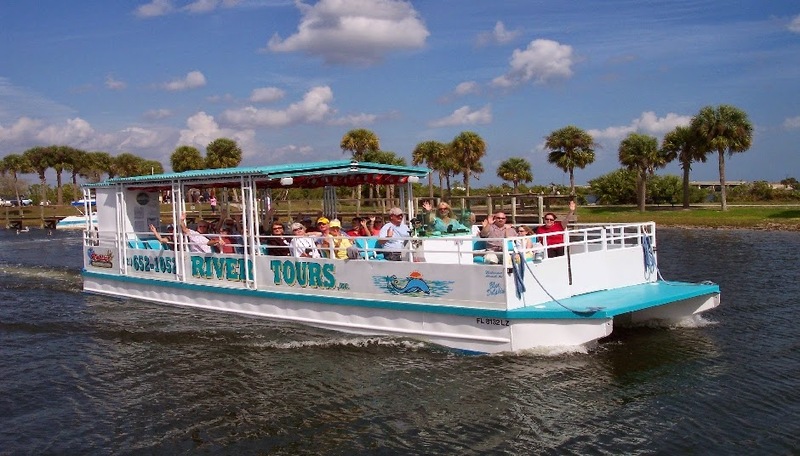 Call Space Coast River Tours at 321-652-1052 to book a boat trip, especially one of their special excursions. For Valentine's Day, they're doing a Chocolates and Champagne tour and they also have Rocket Launch tours. Their tours are Monday – Friday 1pm, Saturday there's a Port Canaveral Lunch tour at 1pm, and Sundays they launch at 3:30pm to see the cruise ships leave. For more information on pricing, directions, and more, please visit www.spacecoastrivertours.com . Thank you Capt. Mark and Carol Noble! Southbound Right Whale Off New Smyrna Beach! Score one for right whale conservation and research! MRC's hotline rang at 10:13am this morning and Sally Thomas was on the other end. Sally had attended a right whale lecture at the Marine Discovery Center in New Smyrna Beach just 5 days ago, and got to see a right whale today! Within five minutes, Mark Atkinson with Volusia County Beach Safety and Ocean Rescue confirmed the whale off Flagler Ave in New Smyrna. A fantastic effort was made by many citizens and organizations in the following hours to document, tag, and collect a small skin sample from the whale for genetics research. MRC would like to thank Chad Truxall, Executive Director of the Marine Discovery Center in New Smyrna Beach, who later located and stayed with the whale until the Marineland Right Whale Project and Florida Fish and Wildlife arrived by air and boat, respectively. Thank you goes out to Kathy Nobles for submitting citizen photos and to Kem McNair, New Smyrna Beach photographer, artist, surfer, and musician who helped secure ID-quality land-based photos on a moment's notice. Kudos to Becki Smith, Joy Hampp, and Jim Hain at the Marineland Right Whale Project for their aerial photos and for assisting Florida Fish and Wildlife with their boat-based research efforts. Today was an example of a fantastic collaboration between citizens, local and state agencies, and non-profit organizations, not only to help protect right whales in the short term, but to learn a little about them in the process, and help secure a future with right whales in it for the long term. Great job, everyone!